Find & Make Dinner Reservations At Tons Of Restaurants! So I was out with some friends the other night in Boston. We were just hanging out, walking around, enjoying the night life. As usual, one of us gets hungry and convince everyone else it’s time to eat. But what do you do on a Saturday night? Most tables in restaurants are reserved for weeks. Well, I decided to try out OpenTable. 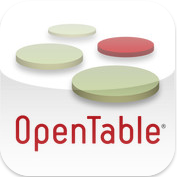 This app is awesome – it lets me make free reservations on my phone! So, we searched, found a few spots near our location, made a reservation, got it confirmed, and then used a map to find our way. Wow, that is insanely useful. Also, if you’re a member you can earn Dining Rewards Points that you can redeem for dining cheques, manage reservations, and invite people via email! Get it for free in iTunes!